The first week of June was glorious and we did no work at all at Hanwell on account of playing host to a group of morris dancers - Maroon Bells - from Colorado, strange but true. 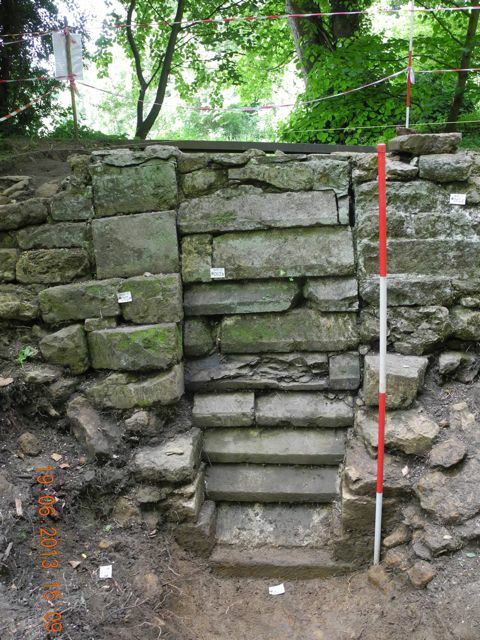 Once back on site it was to find that work was considerably advanced in the building programme at the castle and part of the early twentieth-century block was pretty well demolished. 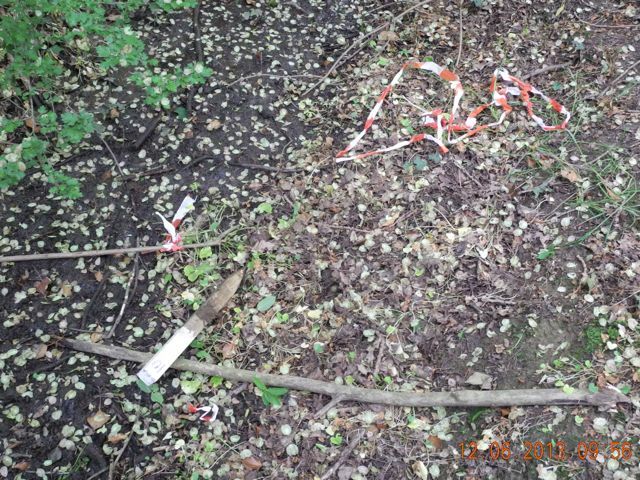 It also appears that we have had our first attack of vandalism as some bright sparks went around uprooting three of our white peg fixed points. Oddly enough it was far easier to reinstate the pegs with a few blows of the mallet than it must have been to wrestle them out from the ground in the first place, still an unsettling development. Demolition of a fixed point. 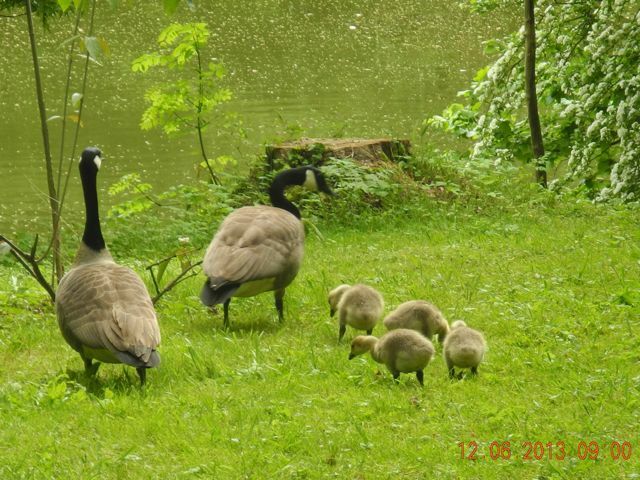 The Canadian Geese and their brood are now pretty mobile so I'm happy to return to the island to recommence work, however, there is still plenty to do in the vicinity of the 'sluice'. 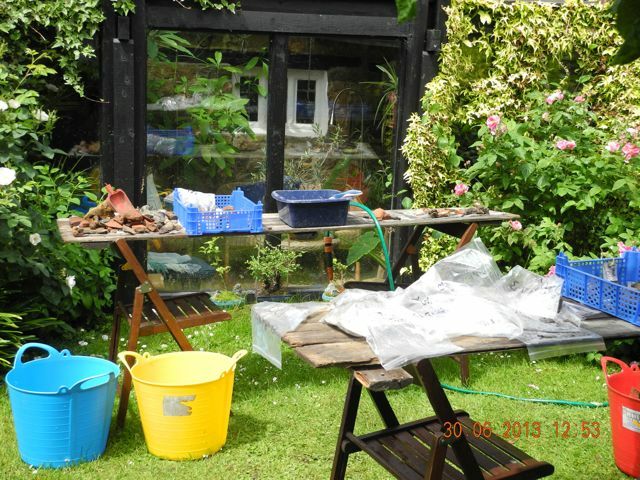 There's more rubble to remove but the end does appear to be in sight and we do at last seem to have left the twentieth century behind with the current crop of finds dating from the eighteenth century or earlier. The family out grazing Peter out examining a large chuck of iron, possibly a patten. 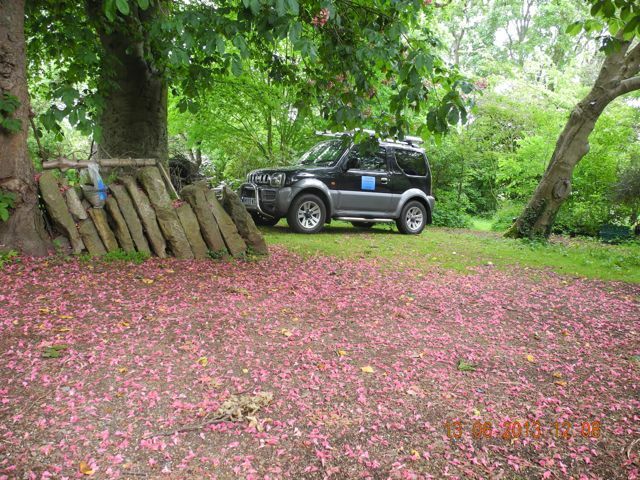 As you can see from the photo of the dig above one of our on-going issues is keeping the site clean from the continuing showers of blossom that rain down upon our heads - there are worse problems to confront it is true so here on a more positive note is the pink carpet of blossom on the car park from the nearby horse chestnuts. 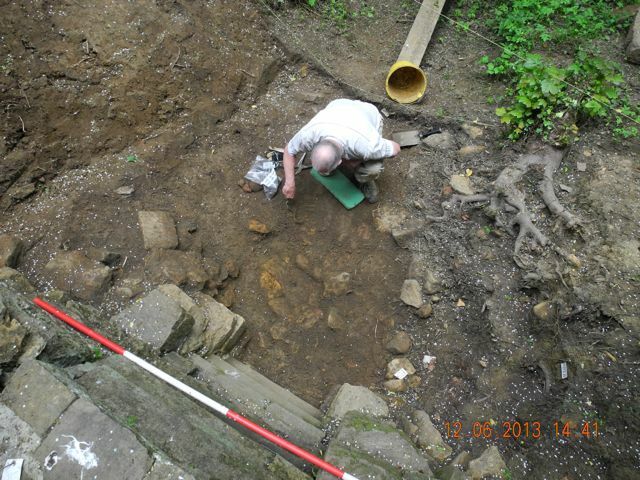 Further recording and removal of rubble has carried us deeper and deeper downstream from the walling. 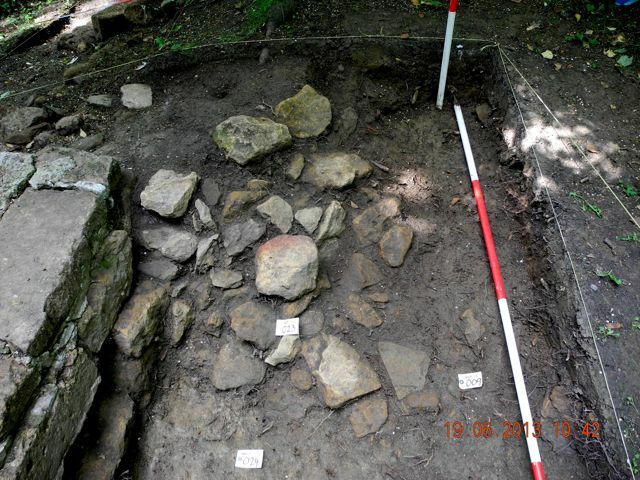 These lower rubble deposits seem to contain more in the way of finds from earlier centuries largely I suspect from the eighteenth century. 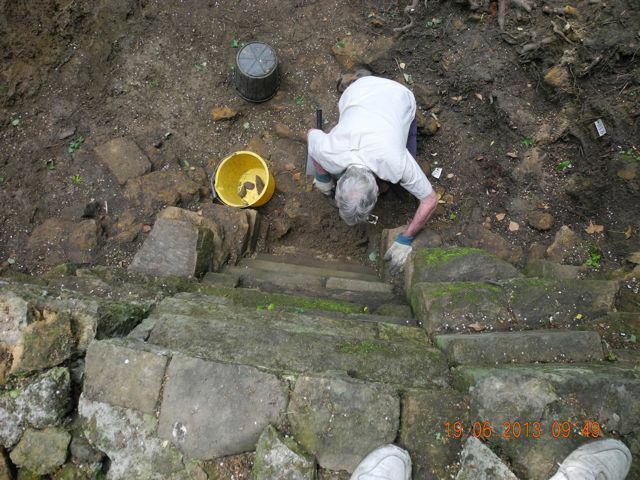 Finally we appear to have hit bottom, at least as far a stone structures are concerned. An expectation that the lower levels of the channel would consist of deposits of thick black sticky mud have not been fulfilled. indeed, it looks very much as if water flowed briskly into the channel, a supply which was suddenly cut off before partially filling in the channel without any intermediate period of stagnation. 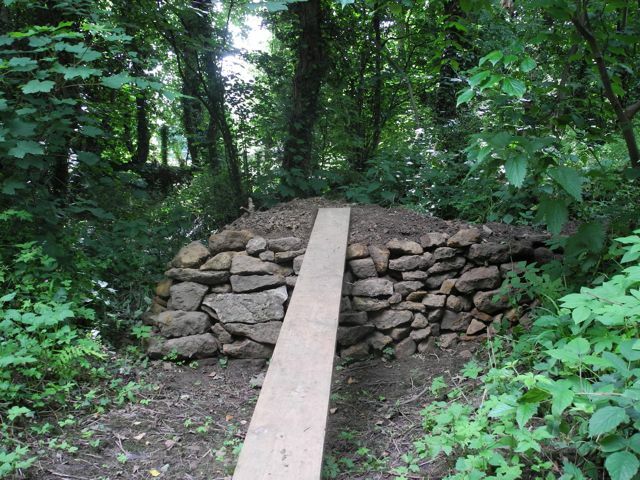 and here's the view of the full height of the walling, the only question now is, "What is it?" On the upstream side what originally appeared to be another dump of rubble now looks like a revetment for a bank considerably narrower than the existing dam, curious, and up on the level ground to the north of the channel the curious lesser ditch which runs parallel to the main channel is so far proving to be rather lacking in interest. 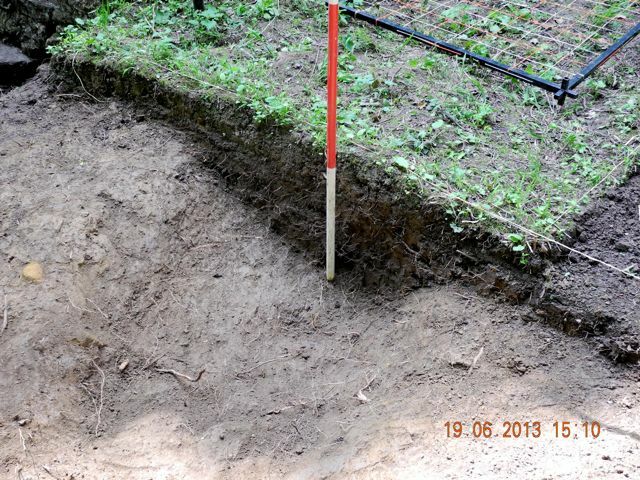 Archaeologists tend to like ditches with their endless capacity for accommodating rubbish. So far this one is really quite clean with a few fragments of clay pipe stem and some seventeen or eighteenth century glass. 023 as we like to call it, revetting the bank to the south. This is a very dull ditch. June 18th. 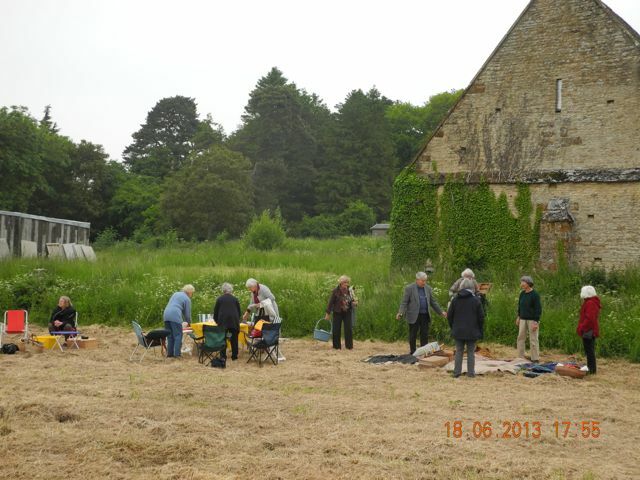 was the occasion of my first opportunity to address the Enstone Historical Society during the course of their summer picnic on the site of some seventeenth century pleasure gardens adjacent to the impressive fourteenth century tithe barn. 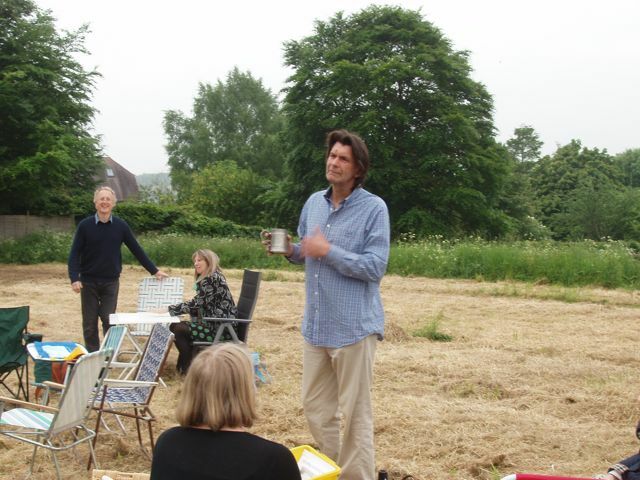 I was very pleased to be invited to give a brief talk about water gardens in general and the Hanwell and Enstone investigations in particular. Despite being something of a gallop, all over in half an hour, it was useful to be able to discuss the topic and begin to outline suggestions for field work around the village. The distinguished audience not only came up with some killer questions but also some very useful suggestions so a very productive night out. Well the ditch and its fill - 024 if you are interested - turned out to be not quite as dull as I suggested above as some 20 cm down into the fill we discovered this rather fine clay pipe bowl with two contiguous sections of stem which brought the total length to around 15 cm. The bowl is nicely ornamented with a combination of vine and grapes motif and judging by the size and angle of bowl it is most likely late eighteenth or early nineteenth century. Peter Spackman has pointed out that such pipes could be associated with local taverns but given that as well as the Vine Inn, Banbury (demolished 1857*), there were also public houses known as The Grapes in Oxford and Chipping Norton we are rather spoilt for choice. 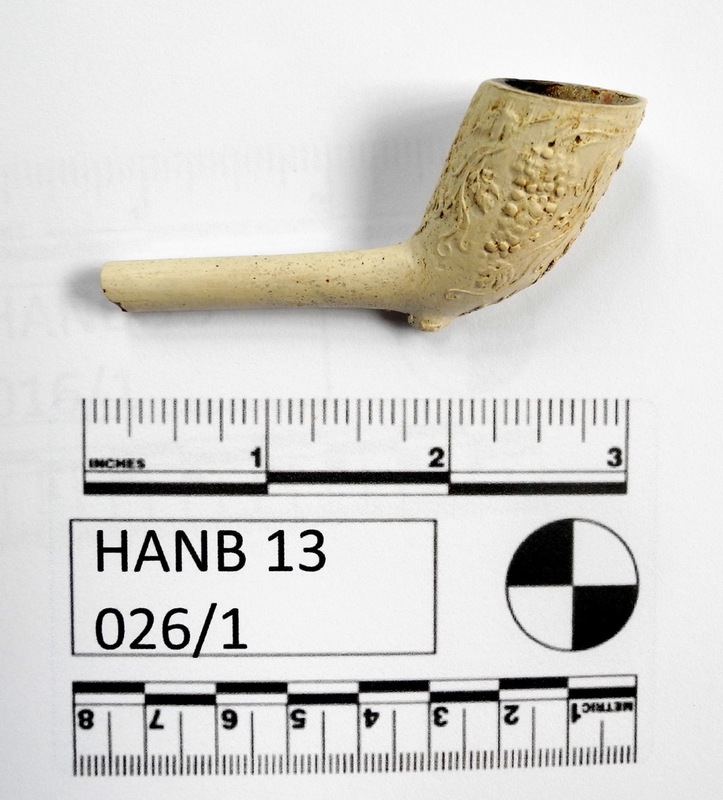 The importance of clay pipes is that as they were rather fragile the date at which they were broken and discarded tends to be fairly close to the date they were manufactured and so they make excellent markers for dating. Several people are looking in to providing parallels and hence a more specific date for the piece, there will be an update once we have the information. As the month drew to a close the channel east of the wall had been pretty well emptied of rubble and we were beginning to see the appearance of what may have been the primary silting laid down during the final phase of use, whatever that use may have been and personally I'm beginning to suspect cascade. Amongst one of the last pieces of rubble to be lifted was this fine piece of moulding. 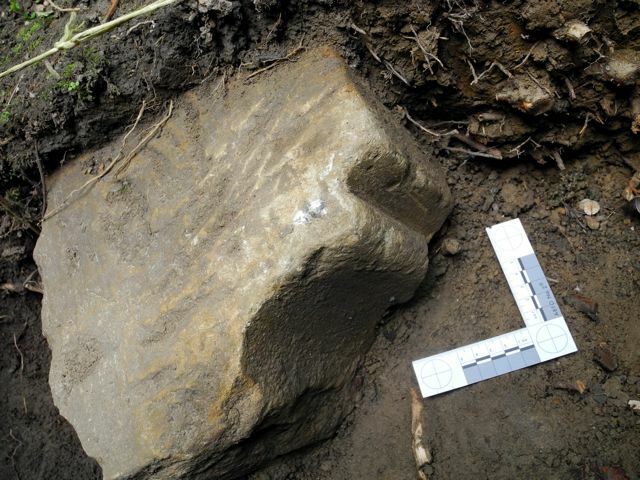 It's rounded profile makes it quite different to any architectural fragments recorded to date. I really must take a long hard look at the surviving mouldings on the surviving bit of the castle. 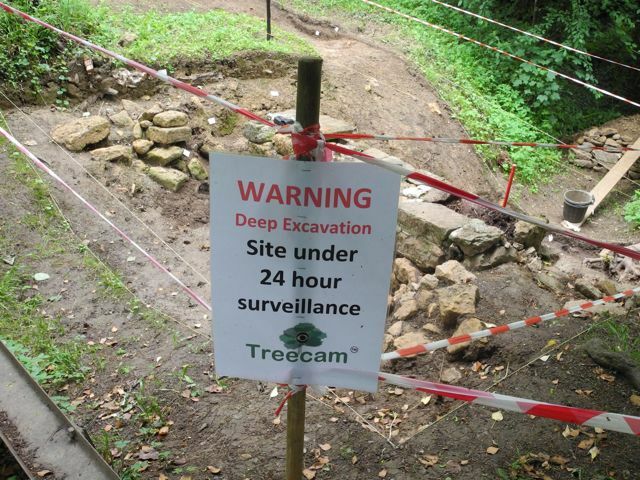 One issue that bedevils archaeologists across the world is the siting of spoil heaps and practically everyone will tell tales of discovering that the pile of dirt had been sited one the one spot it turned out really needed to be dug so the whole thing had to be shifted... by hand. Well at the moment much of our spoil is going down the valley and to keep it tidy as the heap has risen so has the retaining wall we've built with the loose rubble. Walking the plank has a whole new meaning. Architectural fragment, looks medieval, I mean really medieval. Don't ever complain about having to do the washing up. You are being watched courtesy of BIG BROTHER SECURITY Inc.